I can’t quite figure out why Jennifer Weiner’s newest book, Best Friends Forever, has such an uninspiring title. In spite of this rather insignificant shortcoming (that is honestly more than made up for by the gorgeous cover art) I can absolutely recommend this tremendous chick-lit novel to you without any reservations at all. To me Jennifer Weiner is the queen of escapist novels. Her stories are filled with endearing and memorable protagonists that get into and out of bizarre shenanigans in ways that seem truly plausible. Her ability to weave such well-rounded and likable female characters is a true gift, and I enjoy nothing more then to curl up beach-side or pool-side with a brand new copy of her latest novel and drift away. Unfortunately this means that my Weiner books are almost always splattered with a mixture of water, sand, and sunscreen, but it’s a small price to pay for a light summer afternoon read that leaves you feeling truly happy and satisfied. Best Friends Forever examines the relationship and subsequent break-up between childhood friends Addie Downs and Valerie Adler. Addie and Valerie are polar opposites. Whereas Addie is shy, cautious, and prone to weight issues, Valerie is outgoing, curious, and eventually blossoms into a blonde bombshell. Unfortunately the cliques and pettiness of high school lead to a betrayal of trust and Addie and Valerie end their friendship. Then on the evening of their fifteen year class reunion Valerie appears on Addie’s doorstep with blood on her coat and the two women are thrust into an amusing Thelma and Louise like road trip where deep pains from their respective pasts are revealed. There was corn on the cob and clam chowder and red plastic net bags filled with gray clams that Val and her mother called steamers. There was coleslaw and French fries and a tangled mound of thin, crispy onion rings, tall plastic cups brimming with ice and soda, and little plastic dishes filled with melted butter. A dozen oysters lolled slick in their shells on a bed of crushed ice, and two gigantic lobsters sprawled over oval-shaped plates, leaking steaming pale-pink water. See what I mean? I would kill for some clams right now. Absolutely kill! So if you have a little vacation time left this summer and you’re looking for that perfect book to bring along I’d suggest that you promptly pick up a copy of Best Friends Forever and stash it in your overnight bag immediately. 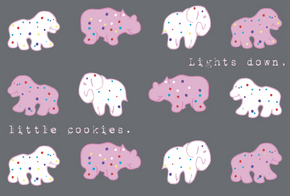 Literally mere moments ago I frantically pulled out my wallet and ordered this adorable tee that pays homage to the unfortunate demise of Mother’s Original Circus Animal Cookies this week. Doesn’t that slogan make you feel a little weepie? Hold on I need a tissue… [link via Slashfood]. 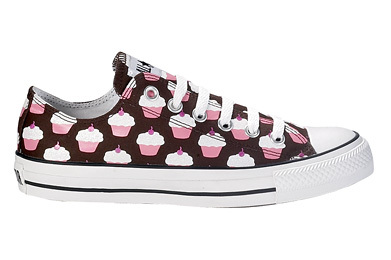 A cute cookie tee undoubtedly needs a pair of pretty funky shoes to match so when Rachel tweeted about these hot cupcake sneakers today it occurred to me that perhaps the pink culinary clothing inspired stars have aligned this afternoon. And just because the hypothetical ensemble I’m creating in my mind isn’t over the top enough, might I suggest some Birthday Cake bling? 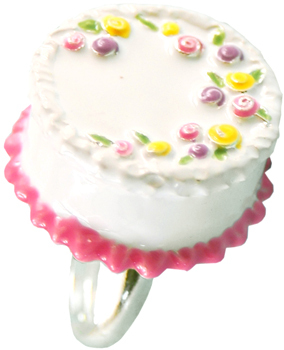 My grandmother used to decorate a strawberry birthday cake for me each year in almost exactly this very style, sans the yellow of course.